The sacred Roman Catholic Jakarta Cathedral has been serving the capital city’s believers for centuries. 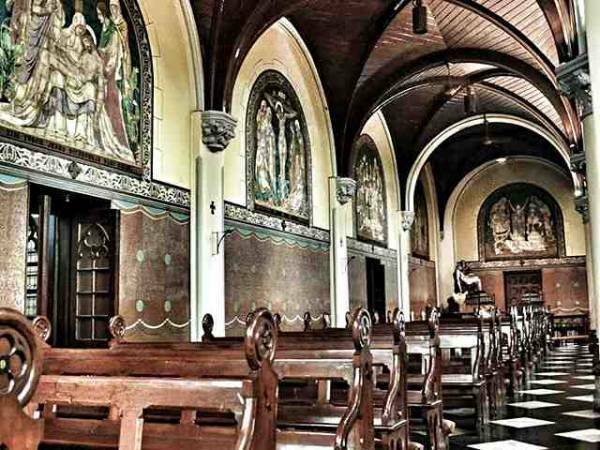 Not only is it a must-go-to place for Christians, it is also Jakarta’s cultural heritage. Its medieval presence amidst the city’s modernism embodies an everlasting fire from the past. It has been a medium for devotees to see God Almighty since 1901. Although there are lots of old-style European structures in the capital, Jakarta Cathedral stands out. Its heavy neo-gothic nuance makes this church different from other, mostly Dutch-fashioned, buildings. Even the exterior sends passersby seeing it back to ancient Europe. Two high towers with pointy iron-based spires flank the shorter main entrance. The gray coarse-surfaced walls resemble the walls of castles and palaces of that western continent. Another great thing about the Jakarta Cathedral is, it is located right across Indonesia’s grand mosque Istiqlal. Both majestic places of worship dominate the neighborhood in Sawah Besar, near the governmental complex. It is like a reminder to the authorities to run the country without neglecting God. The Jakarta Cathedral living side by side with Istiqlal also symbolizes the desired religious tolerance in Indonesia. Talking about Jakarta Cathedral’s history is like talking about the city’s history of Christianity. The Dutch colonials did not invade the Dutch East Indies (now Indonesia) only for spices. They were also on a mission to spread the words of Christ to the natives. Batavia (the old Jakarta) as the center of their operation was one of their “targets”. Despite Christianity started to grow in Batavia in the early 1800s, there were no churches yet. Thus, a Dutch high-rank official Herman Daendels gave a humble chapel to the Dutch missionaries. The chapel was in Senen, Central Jakarta, and its condition was far from proper. The missionaries fixed it with some locals and in 1810, the renovation was completed. The chapel officially became Batavia’s First Catholic Church, or Gereja Katolik I Batavia in Indonesian. It could host a small congregation of at least 200 people in one service. Unfortunately, the chapel was engulfed in devastating flame in 1826—it was heavily damaged. Hence, another high-rank figure of the Dutch East Indies, de Gisignies, lent a hand. He offered the church officials to buy a secondhand building at a certain price. The building was in Waterlooplein, or around the present Lapangan Banteng, Central Jakarta. The church officials took the offer and gathered some money to fund the renovation. De Ghisignies assigned an architect, Tromp (full name and nationality unknown), for the project. Tromp did the design and construction of the church which took three years to finish. It was 35 meters long and 17 meters wide and completed in 1829. Due to aging and inefficient maintenance, the church collapsed and turned to ruins in 1890. It, therefore, called for another painstaking construction to build a new structure from scratch. This time, a Dutch pastor with years of architecture expertise Antonius Dijkmans was in charge. The 1891 groundbreaking ceremony marked the beginning of the construction that lasted for ten years. Technically, the construction took three years—it stopped for seven years due to financial reasons. The Church of Our Lady of Assumption, the present Jakarta Cathedral, was officially open in 1901. This classic cathedral actually has three names in different tongues, other than English. In Indonesian, its full name is Gereja Santa Perawan Maria Diangkat ke Surga. Meanwhile, in Dutch, it is De Kerk van Onze Lieve Vrouwe ten Hemelopneming. This three-name place of worship also has another unique feature; it literally has a museum. Magelang-born Monsignor Julius Darmaatmaadja officially declared Cathedral Museum open for public in 1991. It was on the second floor but now it is next to the Cathedral’s bookshop. Father Rudolf Kurris, however, is the mastermind of the museum following his interest in history. Given the importance of Jakarta Cathedral’s history, Kurris thus established this museum. Therefore, he could pass down its crucial information from generation to generation to come. It cautiously preserves the antiques of early Christianity in Batavia from the 19th century. Some of the museum’s exhibits are stamps, paintings, religious relics, and silver cups. Robes and hats belonged to the Archbishops and Cardinals are also on display. See-through glass boxes ensure the robes and hats inside will be safe and preserved. The robes are of various colors such as bright green, deep red, and ivory white. A Belgian, wooden-based, pipe organ is another highly-valued treasure of the Cathedral. Its legs are two meters long, making it “hover” above the main hall’s benches. It has 1,000 pipes and it boasts neo-gothic decorations that go well with the building. The Cathedral’s choir, conductor, and organist are the only ones allowed to play the organ. 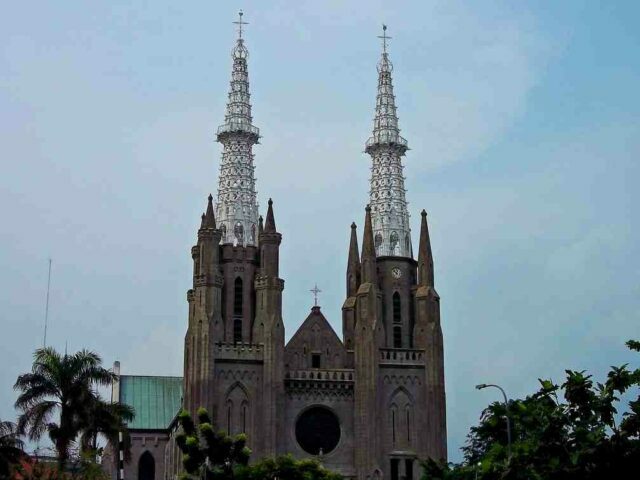 Just like most churches, Jakarta Cathedral bears a form of a cross. It is 60 meters long and ten meters wide, and each aisle is five meters. It has three main spires known as Turris Davidica, Ivory Tower, and Angelus Dei. The first two are 60 meters tall and standing on the sides of the entrance. Angelus Dei is shorter, only 45 meters, and sitting on top of the roof. It consists of two floors and the whole building is made of bricks and plaster. Inside, the high ceilings make churchgoers feel small as they rise meters above the ground. Layers of light brown teaks cover the ceilings in a shape of an oval. Black and white tiles create a checkerboard-patterned floor of the main hall. Hundreds of teak benches in the main hall provide comfortable seats for thousands of worshippers. An enormous round stained glass Rozeta Mystica gives a beautiful and solemn touch. 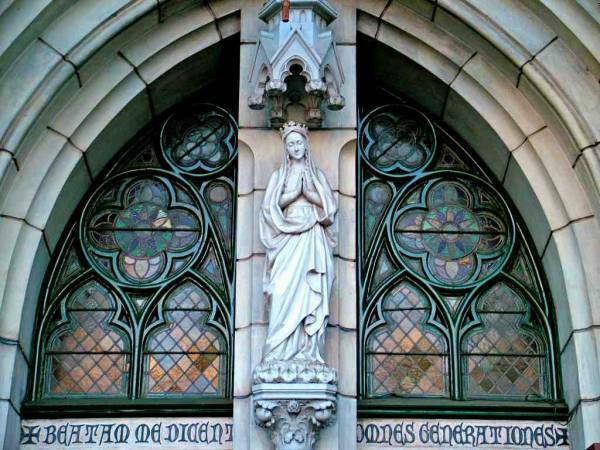 Statues of saints and biblical figures, Our Lady Mary and Pietà, adorn the building too. As for the walls, there are several classic paintings portraying scenes from the Holy Bible. Other than preaching about Christianity, Cathedral also echoes “Amalkan Pancasila: Kita Bhinneka, Kita Indonesia”. In English, it is “Apply Pancasila: We are Bhinneka, We are Indonesia”. It serves the congregation by having a daily mass at 6 AM and 6 PM. Saturday Mass is every 6 PM, Sunday Mass is held many times at different hours. As for the museum, visitors can come on Monday, Wednesday, or Friday, 10 – 12 AM. For those wanting to drop a visit on another day must contact the Cathedral’s officials. Nearby Attraction: A Tour To The Biggest Religious Site, Istiqlal Mosque. Visitors are welcomed to visit the church and museum, there is no entry fee. See: Visit The Jakarta Landmark, National Monument Monas & Museum. 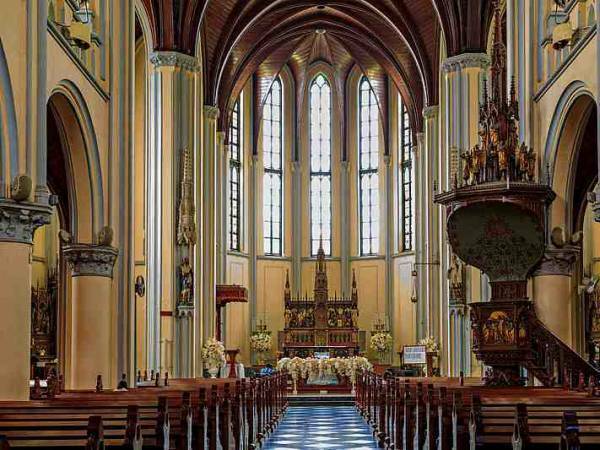 Thanks to the proper maintenance and attention to details, Jakarta Cathedral is fully equipped. It has clean public restrooms, parking lots, and air conditioners to ensure a comfortable visit. Lots of food carts sell mouthwatering dishes and snacks in front of the Cathedral. Its strategic location in the middle of Central Jakarta makes it easily accessible. Take Transjakarta Busway serving Pusat Grosir Cililitan (PGC) – Harmoni from PGC, stop at Juanda. From Juanda Busway Shelter, walk to Jalan Katedral as it leads to Cathedral. It is only 350 meters, so travelers should reach the destination in five minutes. As for those going by train, get on KRL train Bekasi (or Bogor) – Jakarta Kota. Stop at Juanda Train Station and walk for about 500 meters to Jalan Katedral. It will take about 7-10 minutes of walking, depends on the vacationers themselves. Make sure to put on polite, unrevealing, outfits to visit Jakarta Cathedral. The Roman Catholic church is located in Katedral street No.7B, Ps. Baru, Sawah Besar, Central Jakarta, Daerah Khusus Ibukota Jakarta 10710.